NILU and FMI are working on improving the understanding of methane (CH4) fluxes in Arctic and sub-Arctic using inverse modelling. Inverse modelling involves using observations to improve knowledge about some unknown or only poorly known variables, which cannot be easily observed directly if at all. In this case, the observations are atmospheric CH4 concentrations and the unknown variables are fluxes of CH4. A model of atmospheric transport is needed to relate the concentrations to the fluxes. Since the problem is under-determined, statistical optimisation techniques are used to find the optimal fluxes, i.e., those that best explain the observations while being guided by prior information and its estimated uncertainty. The major sources of CH4 in the high latitudes are wetlands (via microbial methanogenesis), oil, gas and coal (via fugitive emissions and incomplete combustion) and, to a lesser extent, wildfires. NILU is using the inversion framework, FLEXINVERT, with observations from 22 stations in the high northern latitudes to optimise CH4 fluxes for the period 2005 to 2012. FLEXINVERT uses the Lagrangian atmospheric transport model, FLEXPART, to determine the relationships between the changes in CH4 concentration at the observation sites and the fluxes. Figure 1 shows the annual mean posterior CH4 fluxes (left plot) for year 2009 and the difference between the posterior and prior fluxes (right plot) from FLEXINVERT. The inversion finds large emissions in the regions of the Western Siberian Lowlands (WSL), the Hudson Bay Lowlands (HBL) and western Canada. The emissions are due to combined natural, i.e., wetland, and anthropogenic sources. 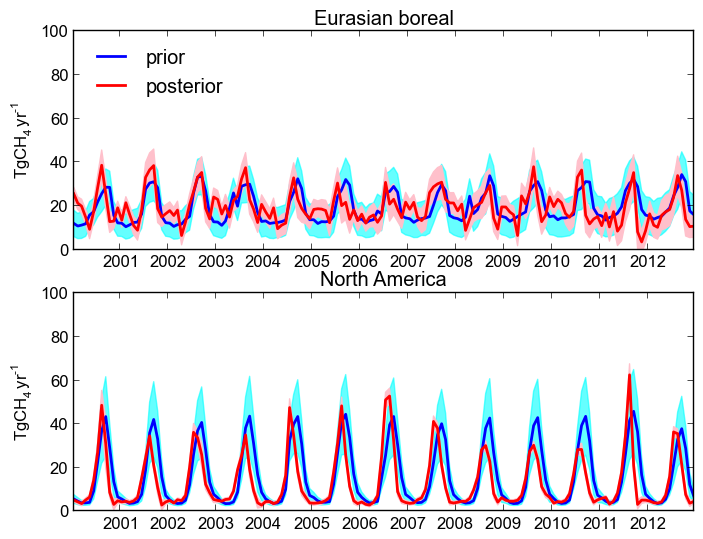 Figure 2 shows the fluxes integrated over the North America and Northern Eurasia (>50°N) for each month. FMI is using the inversion framework, CarbonTracker Europe-CH4 (CTE-CH4), with over 100 observation sites globally to optimise CH4 fluxes. CTE-CH4 uses the Eulerian atmospheric transport model, TM5, to determine the relationships between the changes in CH4 concentration at the observation sites, and the fluxes. Currently CTE-CH4 uses only 9 stations in the high northern latitudes (>60°N) and optimizes global fluxes for the period 2000 to 2012. Figure 3 shows the annual average prior and posterior CH4 fluxes and their difference from CTE-CH4. High northern latitudes are a weak source of methane compared to Tropics. However, there are some regions with large emissions (hot spots) of equal magnitude to e.g. Central Europe and South America. The current version of CTE-CH4 has difficulties optimizing the fluxes for the high northern latitudes due to the sparsity of observation sites but new inversions with more observations will be run within the eSTICC project. Figure 4 shows the comparison of the integrated Boreal Eurasian and North American (>60°N) emissions with the prior estimates. 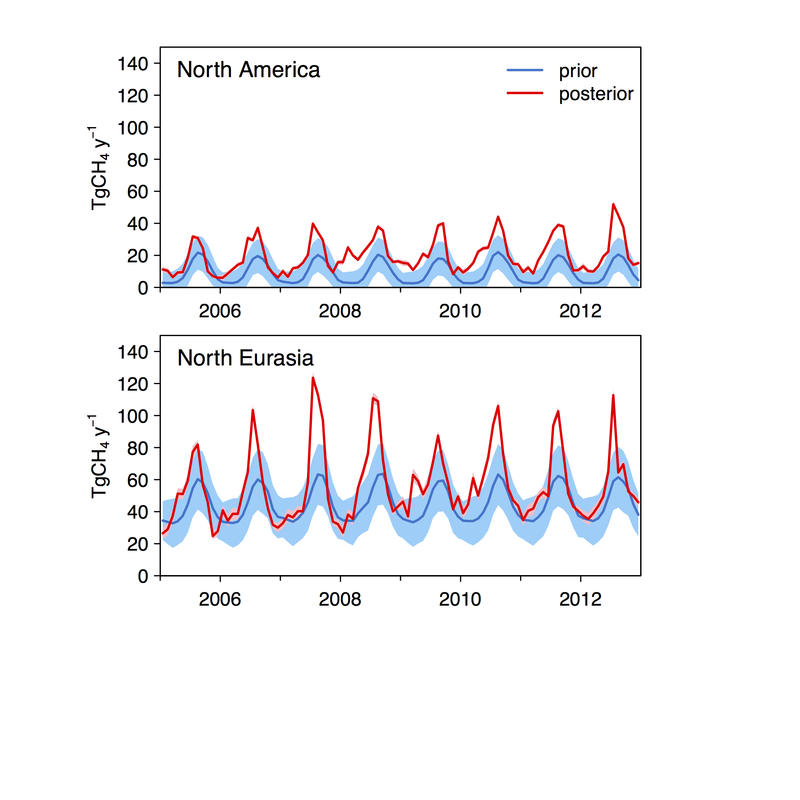 In North America, the posterior summer maximums for 2008-2010 are low compared to other years. Currently, FMI and NILU are working together to compare their CH4 flux estimates for the same regions (note that the regions presented in Fig. 2 and 4 are not the same for each inversion and thus cannot be directly compared).